The following is the third message that we received in Avalon ~ The Rebirth of the Golden Grail Within ~ that took place over several huge grand astrological trines in July 2013. You can find our other messages on our website at www.alunajoy.com under the "Articles for Personal and Planetary Transformation" link. We sugest that you read them in order as each message builds upon the previous one. We are sharing this message here with you just as we received it, in present time, with very little editing. We do this for a very important reason. We know that the messages that we receive are not just for our groups, but are for others as well. The the Star Elders assure me that the message and the corresponding energy will be transmitted to you. So as you read this, you might want to imagine that you are with us. Also, always view the photos on the website that we share, as photos also hold some energy of the sites. It has been 9 months since I receive this message. Spirit would not allow me to post it until now. I feel this delay of posting has to do with the upcoming Grand Trine and Eclipse window in April 2014. When we entered the crop circle on July 18, 2013, the Star Elders began quickly with a powerful process that was mind boggling. If you make it to the end of this post, you will have been in for a ride. Readers . . . Now imagine that you are lying down in the center of the crop circle. (Use Photo) It might help if you lie on the floor while reading this with a favorite crystal placed near the top of your head. You may need to print this message to do so. At the center point of the crop circle is a double-star tetrahedron. This is where two tetrahedrons join together. 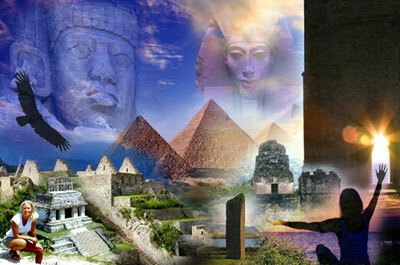 There is one pyramid coming up from the Earth and one coming down from sky. We are being placed in the center, where the two tetrahedrons meet. 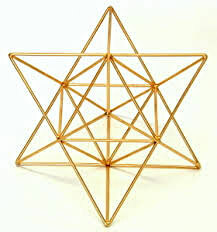 So we are in the center of a newly formed Earth/Sky Merkaba (double-star tetrahedron). We are beginning to experience a woozy, dizzy feeling. Yes. The Star Elders are telling me they are . . . taking away our sense of gravity for a little while, so it's going to make us feel somewhat woozy. At the same, they are taking away the magnetics in our bodies. Magnetics hold our memory and history and programming. This will help us clear our past and prepare for the future. The Star Elders are going to float us between what was and what will be. They want us all to connect together and place our heads towards the center of the circle. Okay, we are in a powerful new Merkaba. We are feeling kind of woozy, as if we are on an ocean. This is because they (the guardians) are placing us in a Merkaba that is between the worlds. We are in a space between what was and what will be. The guardians are the people from the stars who made this crop circle. When I first walked into this crop circle, I felt an extraterrestrial connection, which is fairly common to all the crop circles. They want to raise us up out of our gravity field because gravity is created by magnetics, and magnetics hold in our history. In our past programming and history are found all the wounds and other things we don't want to take with us to the New World. So our Star Family is asking if they can float us between the worlds for a little bit. You are going to feel this in the pit of your stomach. Your whole body is going to tingle a little bit, and you are going to feel dizzy. Whatever you do, please do not sit or stand up fast. They would like to intensify this experience. Are you okay with that now? (You must give permission.) Our Star Family made this circle to help bridge us into the New World and leave the old one behind. [I am feeling this is why I had to wait 9 months to post this message.] We (you) can say it's okay that they amp up the anti-gravity force and help us erase our memories. These are not memories that are essential for us to remain alive in the 3-D dimension - but unhelpful memories of the past. These memories our Star Family are erasing are not our useful memories. They are not erasing things that we need to know to survive in this world. They are erasing the memories that are holding us back from stepping into the New World: the limiting programs that say, "I can't do this" or "I can't have that. I can't manifest. I can't time travel. I can't be limitless." They are going to take away (with your permission) all these limiting programs. The magnetics holding them are going to drop away from our bodies. When our Star Family does this, it will reboot our magnetic (memory) system. When it reboots our magnetic system, our Star Family are going to place us in a space that is in between - floating between the old world and the New World. This will start anchoring in the new Codes of Creation we have been learning about. We will not understand this with our minds just yet, but we will feel it with our bodies. So our Star Family is going to slowly start taking away more and more gravity and more magnetics. We may even feel like we might float off the ground a little. We are going to feel it all the way down to our toes and all the way to the top of our heads. Now Archangel Michael has arrived with a whole team, a legion of White-Light Angels, and they are joining us now. Okay . . . This is his idea, not mine, so it's his joke. You know those little school pencils - the yellow ones with erasers - we had as kids? Well, they are coming in with these big erasers, and they are going to erase all our programming that no longer serves us, or no longer will apply to the New World. Usually they use a pink rubber eraser, but now they are using these things that look like pencils with erasers. I asked why, because they usually use these other pink erasers. They said there is a cord that goes between all the dimensions. While they are erasing, they are also going to make sure our cords between the dimensions are all lined up, so our orientation point stays solid and strong while they are doing all this erasing, because we don't want to lose that orientation point. Every living thing on the planet has this orientation point that's connected to all dimensions through time and space and dimensions past, present, future, body, mind, and spirit. We don't want to lose that, because if we lose that connection, we will go back into spirit. We don't want to do that because we are supposed to take our bodies with us this time as we shift from the old Earth into the New World. When we first laid down in the crop circle, one pyramid was coming up from the Earth, and one was coming down from the sky. They were connecting together. They made a diamond shape in the middle, and we are lying in that diamond shape. Now what they are going to do, bit by bit, is as the two pyramids interconnect, one is going to pierce the Earth, and the other one is going to pierce through and into the sky to complete the bridging process. I can draw this later if you don't understand. So it will actually be a three dimensional, double-star tetrahedron (which we are now in the center of) that is in between the old Earth and the New World. Now the Star Family is asking that we take a few really deep breaths and allow our bodies to sink into the Earth (floor) as far as they can go (group taking deep breaths). Feel your spine sink into the Earth. As you do that, your spirit actually will lift up. It is leaving an old skeletal system behind - an old matrix that was the old you is being left behind. The pyramid that's coming from the Heavens down to the Earth has now pierced through the Earth and continues down, which looks like twenty feet or so, and we are in the middle of this matrix. This pyramid is going to anchor the new Codes of Creation into our bodies. By dropping yourself into the earth, you are letting go of the old matrix. This is very similar to astral projection, but the Star Family is using it now for us literally to walk away from our past programing. Now I'm seeing a lot of blue light coming in. Is anybody else seeing this light? It is a purple blue. Down by our feet, it's more indigo; and up by our crown chakras, it's more violet. In between it's an indigo color. So if you look at your feet, you will see a lighter turquoise blue; and up by your crown, it's a dark amethyst purple, which is interesting to see. Since we are face up in the sun, we should be seeing yellows, oranges or reds. I'm actually seeing a soft violet color. When you can see this . . . look inside the violet color and relax your eyes while keeping them closed, and in the center of that violet, you will see a circle. Are you seeing it? Great! From this little circle, the light is growing out in a matrix, which is a soft golden yellow. The circle is shooting out light rays that interweave like a matrix. Do you see this? I'm trying to count: one, two, three, four. . . . The matrix of light looks like it has six points, which is interesting because the crop circle we are sitting in has eight points. But I'm definitely seeing six points on the matrix coming down. Okay, the Star Family is asking if we can bring down this star-like pattern (coming down from the sky) and breathe it into our hearts (group breathing). Now, have you noticed that all of a sudden you aren't feeling as dizzy? Are you feeling that? More stable, less woozy. That's telling us that we have integrated this new Code of Creation coming from the sky, which this circle is anchoring here. There are eight vesica pisces patterns that are merging right about where our heads are positioned (and where I placed our essence bowl), so not only are we sitting in a tetrahedron but we also are sitting in a pulsating new, living Flower of Life. This entire crop circle is contained in a larger circle that holds all this energy right to the center point. It's an acupuncture point for the Earth, so not only are we connecting and collecting the new Codes of Creation but it is now also anchoring these codes into the Earth. This anchoring will start to spread across the Earth bit by bit. There will be other places all over the planet with acupuncture points that are now anchoring the Codes of Creation into the Earth. Everybody across the planet will start feeling some balance return to their lives. So are you feeling more balanced now? Now I'm going to ask this Star Family to help us further. They are very friendly, very beautiful beings. We've come here to this land to help us find a new foundation stone for the New World, and we would really like to be able to place our feet on top of the first stone laid, so we can be emissaries for the New World when we go back home at the end of this pilgrimage. We are coming here with the greatest, best, and purest of unselfish intentions. We aren't doing this just for ourselves. It's not for our personal gain. We have come here as representatives for the Earth and for our global family, and we are asking if the Star Family could help us in any way to find that first foundation stone, and help us solidly plant it in this emerging New World. We ask that we can access this first foothold and get our feet anchored to it. They said we should be patient, for this foundation is coming. [This is why the Star Elders asked me to wait 9 months before posting this message, as this foundation stone has now arrived. Also, I had to upgrade the message from the time I had received it.] We need to get acclimated to the frequency of these new codes before we can actually anchor our feet on the first foundation stone. We might feel "floaty" for a few days while we anchor this process. (Please be careful during this time.) Our new foundation stone that's part of the New World is here; so when we go home, we can be emissaries for this new energy as we spread it across the planet. They are saying we are now accessing the frequency codes that hold the new Codes of Creation, the new Laws of Nature. Oh, now I'm seeing multiple energy pyramids coming down, pulsing one after another. This energy is coming from the place where our Star Family is located. There are also multiple energy pyramids going up into space from Earth and us. They almost look like funnels. They are funneling in energy to and from the Great Central Source that has already shifted into the new codes and the new Laws of Nature. They are funneling light energy down into this crop circle in a figure-eight pattern. They are linking up the new codes of creation and the new Laws of Nature into our solar plexus. They also are linking it to our third eye and to that pure spot in our hearts. From their spherical perspective, this looks like a pyramid within us. By the way . . . once again, you have to give them permission to do this; otherwise, they won't. You have to give them permission because you are literally letting them gain access to you. They cannot gain access into the pure place in your heart that is for you only, but they are going to open up its door so the energy can enter. This energy is the pure creative force of the New World that is untainted by anything contaminated by negative egos. Okay, now the Star Family is going to expand this chakra activation. They are going to your crown and linking it with your root chakra at the same time. And, again they will tie the chakra centers back together through your third eye and your solar plexus into your heart. This way all the centers, everything in between the top of your crown to your root chakra, will be aligned with the new Laws of Nature and the new Codes of Creation. So we still might feel a little woozy in the tummy. I'm starting to feel tingling again because they are actually starting to branch this energy down into the Earth and up into the sky. It looks like it goes maybe ten to thirteen feet into the Earth and ten to thirteen feet above our heads. This activation is going to bubble out into a sphere around us and will be our new aura system. (I didn't know we were going to have a new aura system!) We are going to have a new aura that has been upgraded and uploaded into the new Laws of Nature and the new Codes of Creation, which are basically the same thing. Our new aura looks like about a thirteen foot sphere around each and every one of us. It is going to blend with our old auras because our old auras are connected to the cord that they jokingly referred to as a big cosmic pencil that anchors us to all time, space, and dimensions. The Star Family is working very carefully to merge your old aura with your new one. I'm looking around the circle. It looks like everybody is doing perfectly (also those reading this). So it will be like having a double aura for a while. Your old aura is very small and looks really tired, and the new one looks really vibrant and bright with an iridescent, clear-crystalline appearance. The new aura is slowly but surely over time - over the next two or three years - going to take over your old aura completely. So you have to give them permission. You have to give Creator of All That Is and the Great Central Source and your Higher Self the permission to allow this to happen, so your body can rise up into this new . . . it's going to be your new home base. Now the Star Elders are sharing a bit of history. When people lose this connection between time, space, and dimensions, they end up as bipolar or have mental illness. These people are the ones who can't control themselves; they might plant bombs and do other crazy things. Nuclear weapons will crack souls in this way thus making it very difficult for people to hold their anchoring cord between all the dimensions. This is why the Star Elders are dismantling nuclear weapons all across the planet. They will never allow another one to explode. This is why the Star Elders started working so adamantly with the Earth in the 40s and the 50s: the Star Elders knew that once Earth people gained nuclear power, we also could damage the soul enough that we would lose this connection through all the dimensions. It's very hard to fix once damaged. So we are going to be floating around England in these little bubbles, and eventually we will find a place where we can anchor this energy into the Earth and find our footing on that first foundation stone in the New World - because we are not leaving until we get it (laughter). And so it is. Because we say so - because we are part of God, and we are claiming our God-Self; and when we say we are finding that foundation stone, we mean it. And we will find it, because we say so. We have come down here to do all the hard work for you guys (our Star Family). You chickens (laughter) (cluck, cluck, cluck). Aluna: If the next crop circle is a chicken, we'll get it (laughter), or an egg if Henrietta hitched a ride on the bus (laughter). [Henrietta was a chicken at the Middlewick Cottages where we were staying.] Well, we know we are the brave, and we didn't read the fine print. But we are not a damn bit sorry for it because this has been the wildest ride we've ever had. We wouldn't trade it for anything, and you guys missed out! (Aluna raising her hands to the sky . . . to our Star Family). We are so grateful, so thankful, for this opportunity. 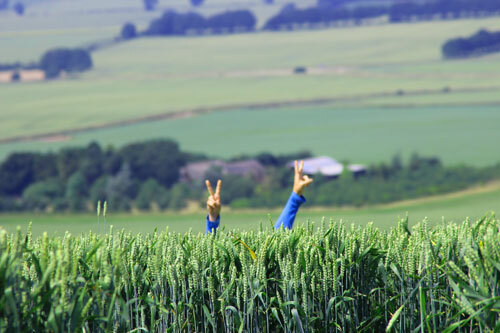 Okay, now they want us to put up our hands, reach to the sky, and send them love and blessings for this crop circle. Thank you so much for allowing us to be here. So now they want us to sit up, really slowly and carefully. Open our eyes and look around. Doesn't the grass look like a blue teal color now - not green anymore? v After this amazing activation, we wandered the crop circle to allow the energy to settle in. THANK YOU Bea and David http://www.bardsofavalon.com/ for the awesome group photo in the crop circle!